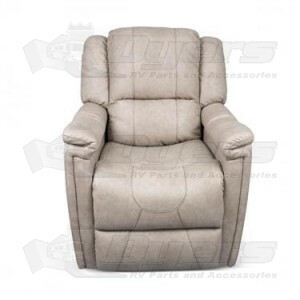 This durable and stylish recliner swivels and reclines easily and will enhance the interior of your RV. Not only will you enjoy the comfort of the Thomas Payne Swivel Glider Recliner, but you will also love the style and elegance of the PolyHyde™ upholstery and modern contrasting stitching brings to your RV. The Swivel Glider Recliner is also low maintenance and easy to clean, perfect for those traveling with pets and kids! Lippert Interiors furniture design philosophy blends attractive external appearance and comfort, functional engineering and state-of-the-art manufacturing processes to bring you the best products, including the Thomas Payne Swivel Glider Recliner. Very pleased with the recliner in general an it is very well made. Only complaint is that the footrest is not long enough and only goes as far as my ankles. Other complaint is that it does not recline as far back as I would like it to be and doesn't want to stay in the reclined position. Other than that, it is comfortable and sturdy.